PPSC is stands for Punjab Public Service commission, this department recruit fresher and experienced candidates in various department of Punjab Government. 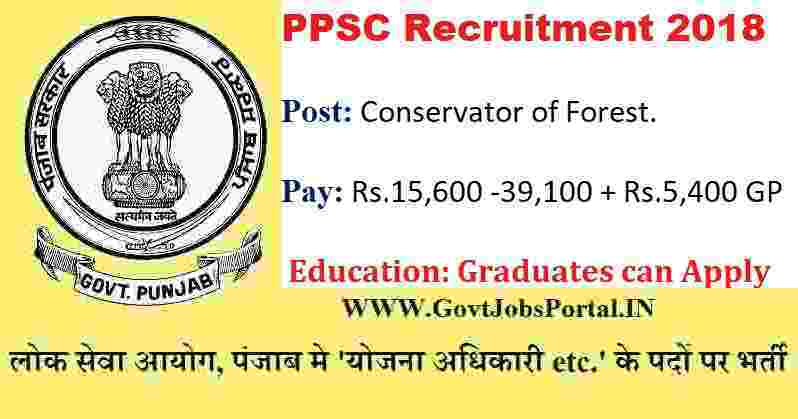 PPSC Recruitment department introduce a new notification for filling up the vacant positions of Assistant Conservator of Forests on their official website. After coming to know about these vacancies we are going to share this information with you. We also share the official PDF file link as well as online application link below at the end under IMPORTANT LINK section. PPSC Recruitment department is going to filling up total 22 vacant positions through this recruitment procedure. So who are interested in working with Punjab Government for a bright future can apply for these Government jobs in Punjab. Fresher candidates are eligible to apply these latest Govt jobs in India 2018. Read the complete article carefully before applying online. 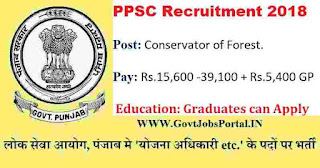 We explained each and every information related to this PPSC recruitment process here. The source of information is the official PDF file which we took from the PPSC official website. Job Profile Name: Assistant Conservator of Forest. Balmiki/ Mazbhi Sikhs, Ex-Serviceman/ LDESM, Punjab. What are the Eligibility Criteria Required? Education: All applicants who have a Bachelor’s degree in the second division in one of following subject must be in Graduation Natural Sciences, Mathematics, Statistics, Geology, Mechanical Engineering, Civil Engineering, Chemical Engineering, Agriculture or Economics of a recognized university or holds an equivalent degree of a foreign university. Indian applicants who have a Master’s degree in the following subjects: “Natural Sciences, Mathematics, Statistics, Geology, Mechanical Engineering, Civil Engineering, Chemical Engineering, Agriculture or Economics of a recognized university or holds the equivalent degree of a foreign university can apply for this PPSC Recruitment 2018. Age Bond: Indian applicants whose age lies in between 18 years to 37 years can apply for these Government jobs in Punjab 2018. The contenders shall have to succeed in the physical test containing of a walkover of 25 Km to be covered in 4 hours. 27TH Sept. 2018 is the Opening Date to Apply. 18th Oct. 2018 is the Last Date to Apply. 25th Oct. 2018 is the Last Date to pay application. Disclaimer: We took this information from the following website: “http://www.ppsc.gov.in/”. So all rights of the above information which we shared goes to this website only.